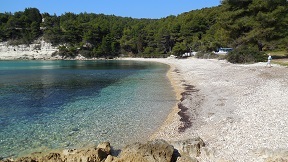 The beach of Milia in the island of Alonissos in Greece, information and pictures. 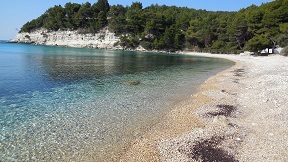 It is a very nice beach which you find on the way to Chrissi Milia with both coloured pebbles and sand, and with clear blue water. 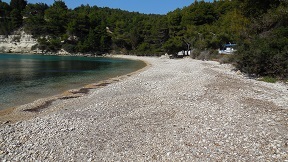 The beach is surrounded by the pine tree forest and pretty rocks. The water is shallow so it is safe for small children. 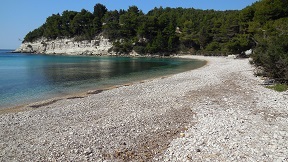 The beach is considered to be one of the most scenic of the island of Alonissos. 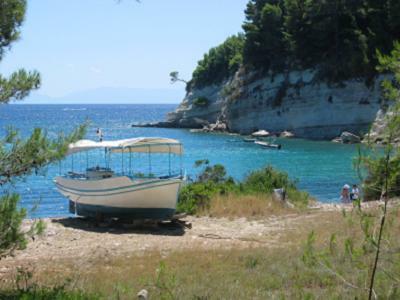 Milia Beach is situated about five kilometers northeast of the harbour of Patitiri. You can reach it by car, bike or on foot from Patitiri or by boat in 15 minutes from the harbor. The walk takes about 30 / 40 minutes and is worth it for the scenery. On the way you walk partly through a pine tree forest. 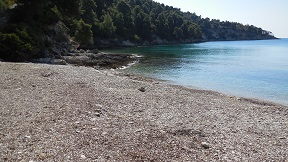 There are no sunbeds and umbrellas for rent on Milia Beach and there are no other facilities. If you want to lie under the shade of an umbrella or you want something to eat or have a drink at a tavern you can go to next door Chrisi Milia Beach.